Between 1963 and 1975 the Sultanate of Oman was the scene of one of the most remarkable, and forgotten conflicts of the Cold War. The British-led Sultan’s Armed Forces (SAF) would battle and defeat a formidable Marxist guerrilla movement based in the southern province of Dhofar. 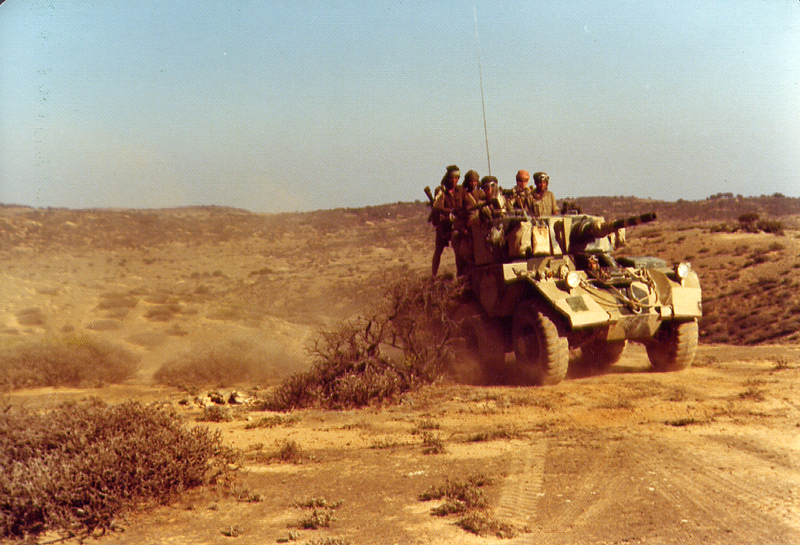 The Dhofar War remains one of the few examples of a successful Western-led counterinsurgency in a postwar Middle Eastern country. An interesting aspect of this conflict is the polyglot nature of the forces involved, with British, Pakistani, Arab, Iranian, and Dhofari irregulars ultimately involved in fighting the rebels (known in Arabic as the adoo), themselves a transnational outfit. A survey of the war raises interesting questions about the myth of fighting ‘localized’ conflicts, insofar as the Dhofar War is often portrayed as an isolated contest between British and Omani troops and the Dhofari guerillas. . It also draws interesting parallels with other ongoing multi-faceted counterinsurgencies as seen in Yemen, Syria, and Iraq. As exhausted Western publics become increasingly hesitant to commit large-scale forces to conflicts in the Third World, their governments may depend on regional allies to provide the necessary manpower instead. The war in the ‘Frankincense Mountains’ provides lessons in the benefits and complications of such strategies. The Dhofar Rebellion started in 1963, initially as a small-scale tribal revolt by the Dhofar Liberation Movement (DLF), against the Sultan of Oman, Said bin Taimur, whose regressive rule could be charitably described as medieval. Under his rule modern medicine, spectacles, and radios were banned. This backwardness was particularly pronounced in the southern province of Dhofar, which was culturally and ethnically distinct from the rest of Oman. Omani soldiers during the Dhofar Rebellion. The DLF initially could only annoy the Sultan’s Armed Forces. British seconded and contracted officers provided the top leadership of the two thousand strong force, including the Commander Sultan’s Armed Forces (CSAF). The rank and file were composed of Arabs and Baluchis, the latter the legacy of Oman’s overseas colony of Gwadar in Pakistan. Having established relations with the Sultanate in 1646, the British were keen to maintain the rule of the Sultan. Oman’s continued importance lay both in its energy reserves and geostrategic location, controlling the southern littorals of the Strait of Hormuz. Hampered by economic constraints and political sensitivities, British involvement in Oman remained limited. The establishment of the PDRY fundamentally changed the ideological nature of the Dhofari guerilla movement. This change could be clearly seen in 1968 when the DFL rebranded itself as the Popular Front for the Liberation of the Occupied Arab Gulf (PFLOAG). No longer simply content with liberating Dhofar, the PFLOAG was intent on spreading Marxism across the Arabian Gulf. Flush with modern weaponry, they now numbered around 6,000 strong. Skirmishes between government forces and the rebels increased from one or two a week in 1967 to two or three per day in 1969. By 1970, the PFLOAG controlled about 80% of Dhofar, and the British doubted that the Sultan could hold onto the province for another year. The British feared a communist victory in Dhofar would have a domino effect on the rest of the Gulf Arab states, emboldening other regional radical movements to rise up against their governments. What started off as a minor tribal revolt soon metamorphosed into a prominent guerilla outfit with significant foreign backing and serious geostrategic implications. When the Sultan refused to implement reforms, the British overthrew him in July 1970, replacing him with his Sandhurst educated and reform-minded son Qaboos bin Said. The new Sultan agreed to an expansion and modernization of the SAF, while implementing much needed civil development projects. These projects were executed by 22nd SAS teams sent by the British Government and referred to as Civil Action Teams (CAT), and whose taskings ranged from building schools, hospitals, and wells, to providing veterinarian services. The SAF hoped that this modernization policy would prove the new Sultan’s commitment to his previously neglected subjects, thus undermining a major narrative of the PFLOAG. One major decision by the Sultan was to grant amnesty to surrendered guerrillas, who were then incorporated into a new irregular force called the firqat. This strategy was the brainchild of the SAS, recalling the employment of native tribesmen as scouts and trackers during the campaigns in Malaya and Borneo. The firqats were platoon to company sized elements led by SAS personnel. These native units proved invaluable in certain regards, possessing the intimate knowledge of the rebels, the terrain, and local cultural sensitivities that the SAF lacked. Prior to the firqats, virtually no Dhofaris served in the SAF, meaning they were often portrayed as a foreign army of occupation. The firqats helped bridge that cultural gap. Besides serving as scouts and guides, they were also useful in an auxiliary role, holding areas cleared by the SAF. Fighters of the Popular Front for Liberation of Oman, 1977. The firqats had their limitations however. They tended to be argumentative and undisciplined. Most refused to operate outside of their tribal areas, during the Muslim fasting month of Ramadan, or when they just didn’t feel like fighting. Relaying orders to them was not enough; they had to be coaxed into action through lengthy negotiations. Dhofari veteran Ian Gardiner referred to leading them ‘like herding cats’. British officers were often hesitant to divulge them with too much information, as many would warn their relatives still in the rebellion about forthcoming operations. The SAF also sought to subvert PDRY support for the rebels by sponsoring proxy guerillas in the desert region on the Yemeni-Omani border. In early 1969, Britain’s MI6 intelligence service managed to persuade the nomadic Mahra tribe, which inhabited the region, to launch an anti-communist revolt to disrupt PFLOAG supply lines. The Mahra, combining nomadic raiding skills with British supplied modern arms and Land Rovers, attacked the forts that the PFLOAG depended on for their supply lines. The Mahra did extensive damage in the enemy’s rear and relieved pressure on the SAF. By 1972 the Mahra were being led by SAS personnel, and kept an estimated four PDRY battalions occupied by the end of the war. The SAF victory over the adoo would be accomplished through a strategy of population and spatial control, similar to the methods employed during the Malayan Emergency. This plan involved constructing a series of fortified lines consisting of mines, obstacles, and barbed wire across the expanse of the less populated western regions of Dhofar, in order to interdict rebel lines of communications from Yemen. The whole line would be zealously patrolled from a string of fortified bases. A parallel strategy of civil development was pursued east of the lines. Regular forces would seize control of populated areas in eastern Dhofar, from which the firqats would radiate outwards to pacify the surrounding countryside. Once security had been established the CATs could commence their development projects. Initial attempts to seal off eastern Dhofar with the fortified lines failed, as the SAF lacked the manpower or resources to fully disrupt rebel logistics. Having become pessimistic about ending the war quickly, the British concurred that Oman had to seek regional support to break the stalemate. Across the Strait of Hormuz, the Shah of Iran, Reza Shah Pahlavi, was watching the unfolding situation in Oman with increasing concern. With ambitions for Iran to regain its place as a Middle Eastern regional power, the Shah feared the spread of communism into the Persian Gulf. The Shah was keen to support his friend the Sultan, as well as to test his lavishly equipped military (the Artesh) in combat. On the 15th and 16th of February 1973, the Shah sent six Iranian helicopters to provision the SAF garrison at remote Sarfait, who had faced the very real prospect of being shelled into submission by the rebels. Sarfait signaled the start of a large-scale intervention by the Iranians. By 1974, over 3,000 Iranian troops were serving in Oman, including an Iranian brigade battle group and sixteen jet fighters. Compared to the cash-strapped SAF, the Iranians were pampered. The aerial transport capabilities they provided through their C-130 aircraft and Chinook helicopters were their most salient contribution, as prior to Iranian involvement the Sultan’s own helicopters were being stretched to their limits. The Iranian Imperial Navy worked alongside the Omani Navy to interdict rebel supply lines along the coastline, as well as to provide naval gunfire support for troops ashore. Sultan’s Armed Forces soldiers on patrol, Dhofar, Oman. Courtesy of Lt Col Ian Buttenshaw, WKhM, Royal Army of Oman. The British had mixed feelings about the quality of the Iranian troops. The Artesh was overly centralized, with every major decision having to be referred to the Iranian general staff and often to the Shah himself. Officers were often promoted on the basis of loyalty to the regime rather than merit, and field commanders were sometimes too hesitant to use their own initiative. The performance of the Iranian troops also left much to be desired. They rarely patrolled, didn’t understand the idea of fire and maneuver, and often preferred to bunch rather than disperse in a firefight. Gardiner in his memoirs noted that the Iranians were doctrinally inflexible, having been trained by the Americans to fight conventional battles. He also recalled that their soldiers, being easily spooked, often opened fire on friendly forces. Help from Oman’s Arab neighbors proved more complicated. Oman had been diplomatically isolated when Qaboos ascended the throne, as many Arab states viewed the Sultan as a British puppet. British and Omani diplomats were able to use patient diplomacy to reconcile the Sultanate with the Saudis, with whom previous relations had been frosty. With newfound Saudi support, the Sultanate was able to enter the Arab League in September 1971, and later the United Nations. Oman’s admission to these international bodies had a crucial political effect on the course of the war, as it robbed the PFLOAG of its legitimacy as an anti-colonial resistance movement on par with the Algerian Front de Libération Nationale (FLN) or the Palestinian Liberation Organization (PLO). This influx of foreign support allowed Qaboos to finally turn the tide against the rebels. By 1975 the Sultan had 11,000 troops under his command, including 5,000 Omanis, 3,000 Iranians, 1,200 firquatment, 1,000 British, and 800 Jordanians. This massive expansion of manpower and resources allowed the SAF to successfully carry out a policy of population/spatial control. A defensive line called ‘Hornbeam’ was constructed between December 1973 to June 1974 with help from Jordanian engineers and Iranian special forces. The line consisted of eight platoon and company positions stretching for 60 kilometers from the sea to the inner desert, and proved successful in seriously impinging on the PFLOAG’s sustainment. The rebels were forced to switch from using camel caravans for supplies to carrying arms and munitions on foot. Building on the success of Hornbeam, in 1974 the Iranians constructed a second defensive line westwards, dubbed Damavand. Iranian troops prepare to deploy on Operation Nader, Christmas 1974. Photograph provided courtesy of Lt Col Ian Buttenshaw, WKhM. 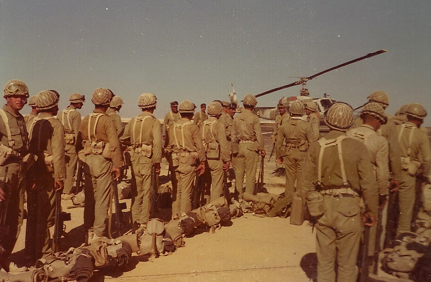 In December 1973 Iranian paratroopers were able to open the Midway Road, which linked Dhofar to the rest of the Sultanate, and which Jordanian special forces subsequently helped keep open. After noting the Iranian tended to be trigger-happy with the natives, the British persuaded Qaboos to deploy the Artesh to the less populated western regions. Thus redeployed, the Iranians alongside the SAF and the firqats conducted a series of non-stop offensives fought in set-piece battles at the end of 1975; finally ridding western Dhofar of rebel presence. As external support for Oman grew, the inverse occurred for the PFLOAG. This dynamic was also in large part due to Oman’s new foreign alliances. Egypt under Sadat dropped their support for the Dhofari cause as Cairo sought better relations with the Gulf Arab states. Iraq also renounced support for the PFLOAG after signing the Algiers Agreement with Iran in March 1975. China would also end support for the rebels as it sought better relations with the Shah. As Oman began to establish itself on the global diplomatic scene, the PFLOAG found itself increasingly isolated. Although the Dhofar War has traditionally been seen in Anglo-centric eyes as a localized, hermetically sealed victory by the British-led SAF over a Marxist insurgency, it was clear the victory over the rebels was a multinational effort. The British commanders had to fight a war in partnership with different forces both foreign and local, each of which had their own structures, motivations, weaknesses, and capabilities. Since the Iranians preferred to fight with overwhelming firepower, it made sense to deploy them in the less populated western regions. There, the Iranians were in a better position to fight the adoo in more conventional, pitched battles. Iranian numbers and resources helped in constructing and manning the defensive lines in western Dhofar, as well as reopening the Midway Road. The presence of Iranian air and air defense assets served as a deterrent to any potential escalation on the part of the South Yemenis. One could draw comparisons with Russia’s current role in bolstering the Assad regime in the Syrian Civil War, providing both overwhelming firepower and deterrence against foreign interference. 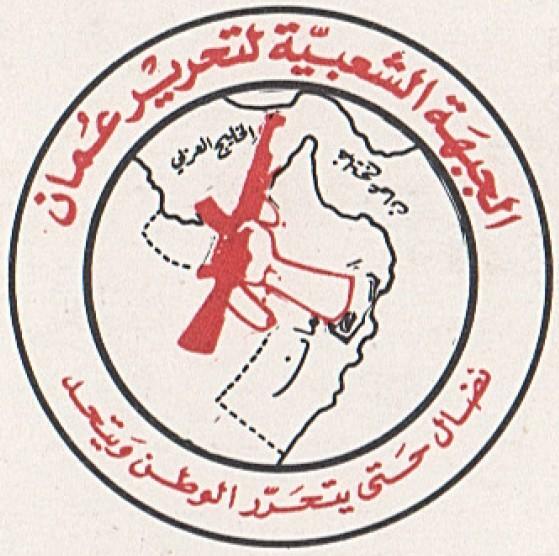 Popular Front for Liberation of Oman | Struggle till the homeland is liberated and united. It is posited that a counterinsurgency can only be won by the armed forces of the host nation. A huge British commitment would have only fueled accusations by critics of neo-colonialism, when in fact forces from fellow Muslim countries such as Iran and Jordan was more politically acceptable. Allies were also useful diplomatically, by persuading patrons of the PFLOAG to drop their support, and setting conditions under which continuing to support the PFLOAG would have isolated them within the international system. The use of native irregular forces like the firqats and the Mahra tribesmen is comparable with the current employment of the Popular Mobilization Units (PMUs) in Iraq or Kurdish militias in Syria. An important fact missed when discussing the employment of local irregular forces in counterinsurgencies was that the firqats never grew strong enough vis-à-vis the armed forces to challenge state authority once the fighting was over. Whether the same can be said of the PMUs in Iraq, for example, remains to be seen. Ultimately, the Dhofar War challenges beliefs that counter-insurgencies can be approached as hermetically sealed conflicts. What had started off as a low-level tribal revolt escalated into a major international conflict involving numerous outside actors. As the PFLOAG became an increasingly transnational outfit in both patronage and ambitions, the Sultan responded by seeking regional allies of his own. The Dhofar War is also pertinent when we look at the future of warfare. Lawrence Freedman, in his recent book The Future of War, argues that Western states have become increasingly wary of interventionism, based on recent experiences in Syria, Iraq, and Afghanistan. Future interventions could thus be predicated on limiting involvement to providing airpower and special forces while others provide the necessary manpower, whether in the form of local irregulars or regional allies. While this strategy of fighting with a ‘light footprint’ can lead to the military defeat of the enemy (as evident by the recent capture of Raqqa last October), it brings strategic limitations. Western militaries would be forced to relinquish control on the ground to local allies, who have their own agendas and interests. The line between military action and political goals thus becomes blurred. The Dhofar War thus imparts us important lessons as we study the future of foreign interventions. The British waged a counterinsurgency in Oman with limited numbers of troops and resources, and were forced to rely on tribal irregulars and regional powers to close the gap. Through the appropriate usage of their respective strengths in both the military and political spheres, the British helped save a geostrategically important region from a hostile ideology, with an outcome largely satisfactory to everyone. Oman today is a stable and relatively developed Middle Eastern country, largely at peace with its neighbors, and uninvolved in the Saudi-Iranian proxy struggles that dominate the Middle East. The history is worth studying. Imran Shamsunahar is a political risk analyst and freelance writer currently based in Kuala Lumpur, Malaysia. He writes on military history and international security. He is also a recent graduate of the University of Hull with a Masters in Strategy and International Security, where he focused on the South China Sea and maritime strategy. 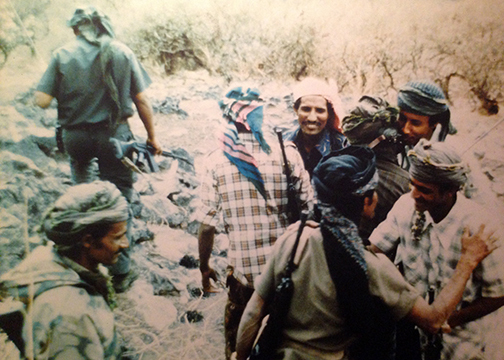 Header image: Firqat fighters embrace after pledging allegiance to Sultan Qaboos during the Dhofar War. Photo taken at the Sultan’s Armed Forces Museum | Institute of Current World Affairs. Ladwig III, W. C. (2008) "Supporting Allies in Counterinsurgency: Britain and the Dhofar Rebellion," Small Wars and Insurgencies, 19:1, 64. DeVore, M. (2012), "A More Complex and Conventional Victory: Revisiting the Dhofar Counterinsurgency, 1963-1975," Small Wars and Insurgencies, 23:1,148. DeVore, M. (2011) The United Kingdom’s Last Hot War of the Cold War: Oman, 1963-75. Cold War History, 11:3, 443 - 445. Gardiner, I. (2006), In the Service of the Sultan: A First Hand Account of the Dhofar Insurgency. Barnsley: Pen and Sword Military, 157. DeVore, The United Kingdom’s Last Hot War, 455 - 456. Goode, J. (2014), "Assisting Our Brothers, Defending Ourselves: The Iranian Intervention in Oman, 1972-75," Iranian Studies, 47:3, 441-462. Hughes, G. (2016), All the Shah’s Men: The Imperial Iranian Brigade Group in the Dhofar War. Available online: https://defenceindepth.co/2016/06/06/all-the-shahs-men-the-imperial-iranian-brigade-group-in-the-dhofar-war/. Hughes, G. (2016), All the Shah’s Men. Gardiner, In the Service of the Sultan, 149 - 155. DeVore, The United Kingdom’s Last Hot War, 458. DeVore, M. (2012), A More Complex and Conventional Victory, 161. DeVore, The United Kingdom’s Last Hot War, 460. DeVore, A More Complex and Conventional Victory, 158 - 159. Hughes, All the Shah’s Men. Hughes, G. (2009), A ‘Model Campaign’ Reappraised: The Counter-Insurgency War in Dhofar, Oman, 1965 – 1975, 296 - 297. Hughes, G, All the Shah’s Men. Ladwig III, Supporting allies in counterinsurgency, 80. Hughes, G. (2016), Uncertain COINage. Available online: https://defenceindepth.co/2016/03/07/uncertain-coinage/. 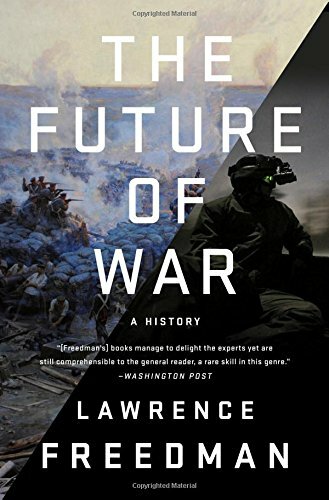 Freedman, L. (2017) The Future of War: A History. United Kingdom: Allen Lane, 284.